The classical roadster, reinterpreted and sportier than ever. Engineered with a focus on maximum agility, dynamism and steering precision. Radically revised proportions, central seating position, shorter wheelbase for increased agility and wider tracks than its predecessor. Modern, high-class interior styling with pronounced driver focus. On sale from 4 October 2018, prices to be announced. First deliveries taking place from 9 March 2019. 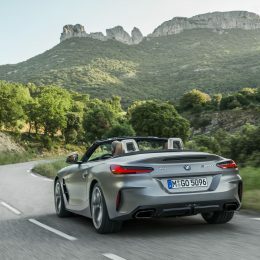 Roadsters have played an important role in BMW’s history and the all-new 2019 BMW Z4 is set to write another chapter in the open-top story. Since the birth of the first example, the famous BMW 328, all BMW roadsters have shared common proportions and design principles – long bonnet; low, set-back driving position, long wheelbase and short overhangs. 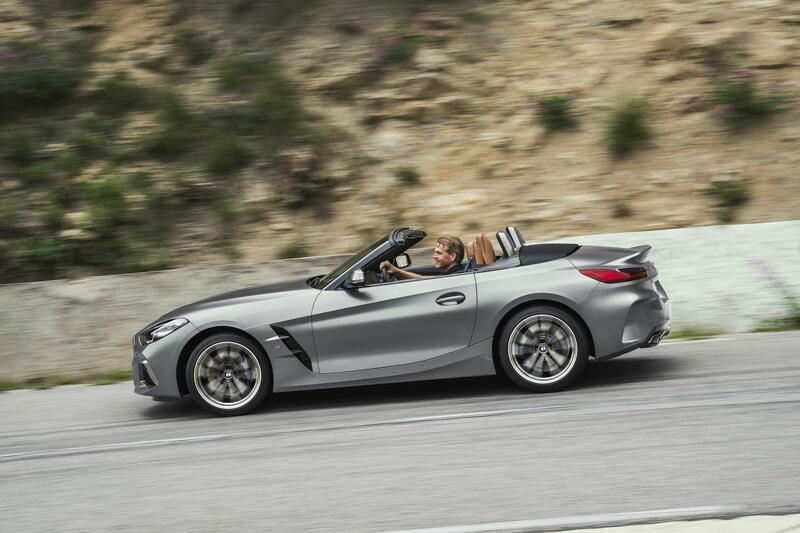 The new BMW Z4 is no different. It shares all of those traditional principles, but takes the roadster experience to the next level with a focus on agility, dynamic performance and precise handling thanks to the high rigidity of the body structure and chassis mountings, the intelligent lightweight design and optimised aerodynamic properties. 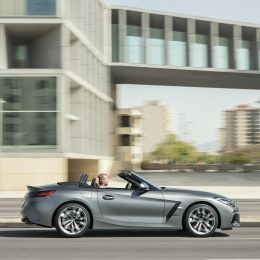 The new BMW Z4 combines its pure sporting pedigree with a wealth of highlyadvanced, top class equipment features on the driver assistance, operation and connectivity fronts. 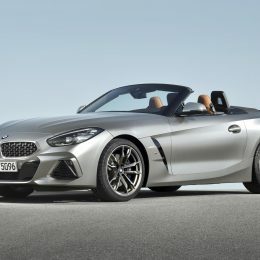 The Paris Motor Show will provide the setting for the show premiere of the new BMW Z4 in October 2018. The worldwide market introduction will then commence in March 2019. 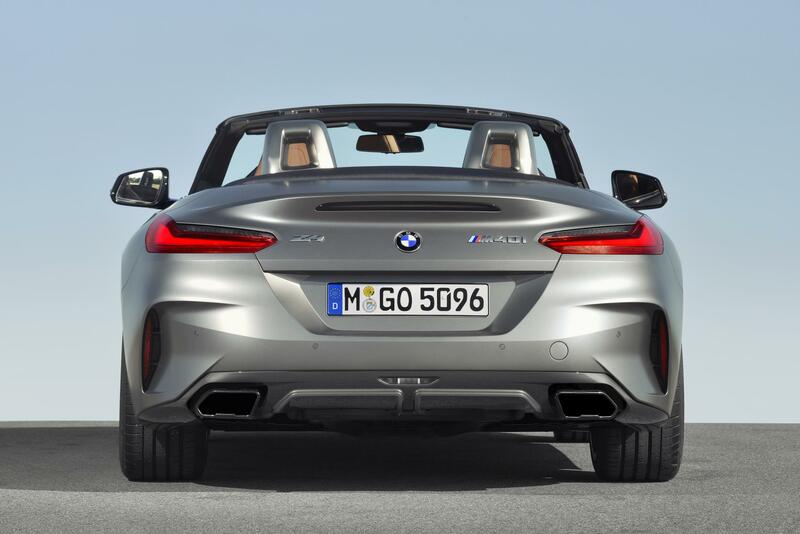 The new BMW Z4 has a low-slung, sporty, compact appearance when viewed from any angle. It is 85mm longer than its predecessor (at 4,324mm), 74mm wider (now 1,864mm) and 13mm taller (1,304mm). The shortening of the wheelbase by 26mm to 2,470mm serves to sharpen agility, as do the notably wider tracks – 1,609mm at the front (+ 98 mm) and 1,616mm at the rear (+ 57 mm). 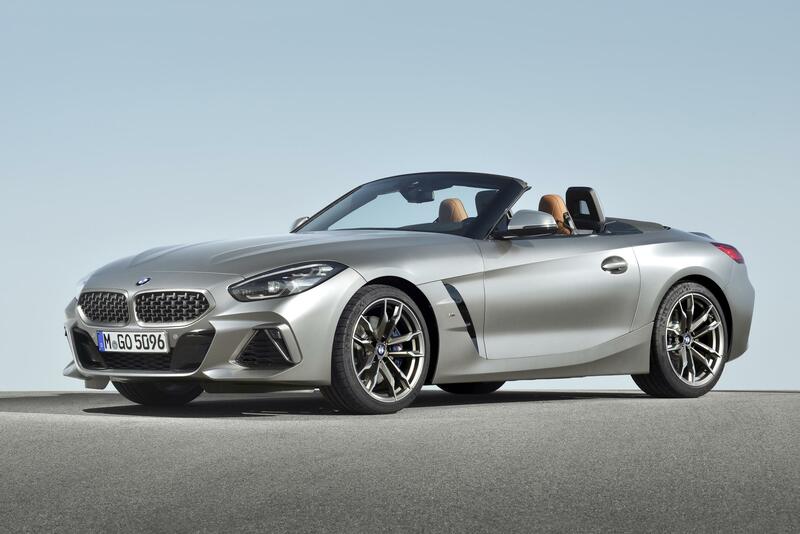 The new BMW Z4 will be built at the BMW Group’s Austrian manufacturing partner, Magna Steyr Fahrzeugtechnik in Graz. Production will take place on an assembly line installed and operated to the BMW Group’s strict standards. A powerfully sculpted front apron with large air intakes, a low, broad BMW kidney grille and headlights positioned at the outer edges ensure there is no mistaking the car from the front. The new-look mesh-design BMW kidney grille combines a track-inspired honeycomb pattern with a three-dimensional structure, whose elements have a vertical arrangement reminiscent of traditional kidney grille bars. The headlight units are another first, with the two light sources positioned one above the other for the first time. The vertical design is intercepted at the top by a diagonal accent strip with integral direction indicator. 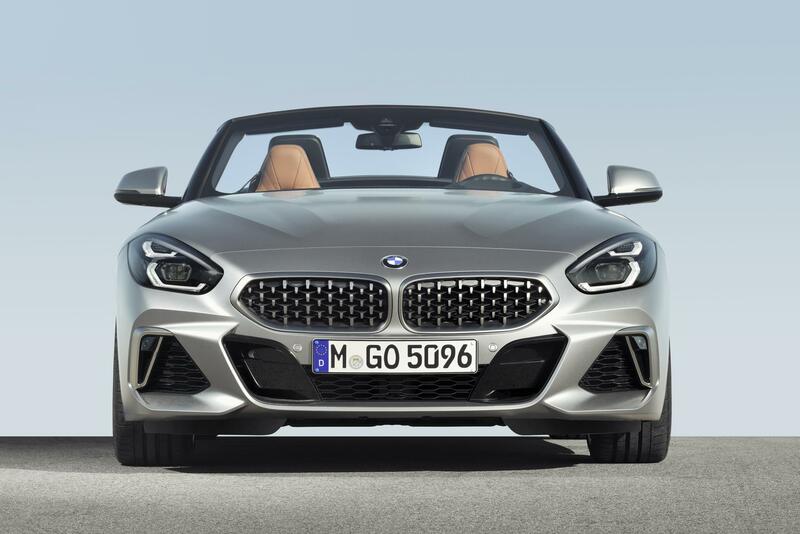 The new BMW Z4 is equipped with LED headlights as standard, while the optional Adaptive LED headlights add a matrix function for the non-dazzling high beam and cornering lights. The elongated bonnet with arrow-shaped contour lines directed at the kidney grille straddles the wheel arches in the “clamshell” style characteristic of classical sports cars. The joins at the bonnet’s sides merge into the flanks’ upper character line, which runs back to the tail lights. A second character line emerges from the large Air Breathers behind the front wheel arches. 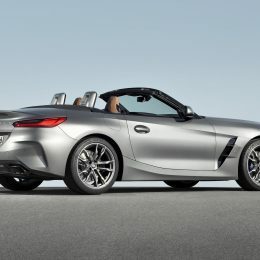 The spoiler and the slender, horizontally arranged light assemblies in the brand’s customary L-shape help to give the tail of the new BMW Z4 a wide, sporty appearance. Scope for individuality: nine body and two soft-top colours. There is a choice of one non-metallic and eight metallic shades for the car’s exterior paintwork. The soft-top roof comes in Black as standard and Anthracite with silver effect as an option. It is electrically operated and can be opened or closed in the space of ten seconds, even while travelling at speeds up to 31mph. 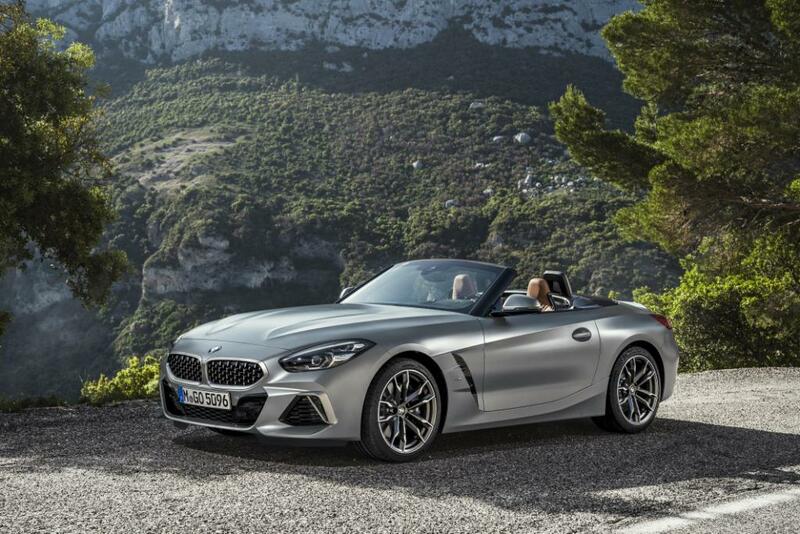 There will be two trim levels for the BMW Z4 in the UK, Sport and M Sport in addition to the M Performance model. The Sport model features design elements in High-gloss Black on the front crossbar and the rear apron’s insert, along with 18-inch light-alloy wheels. The highlights of the M Sport model, meanwhile, include a three section air intake for the front apron, prominent side skirt contouring, a rear apron with highly distinctive side surrounds and 18-inch M light-alloy wheels. 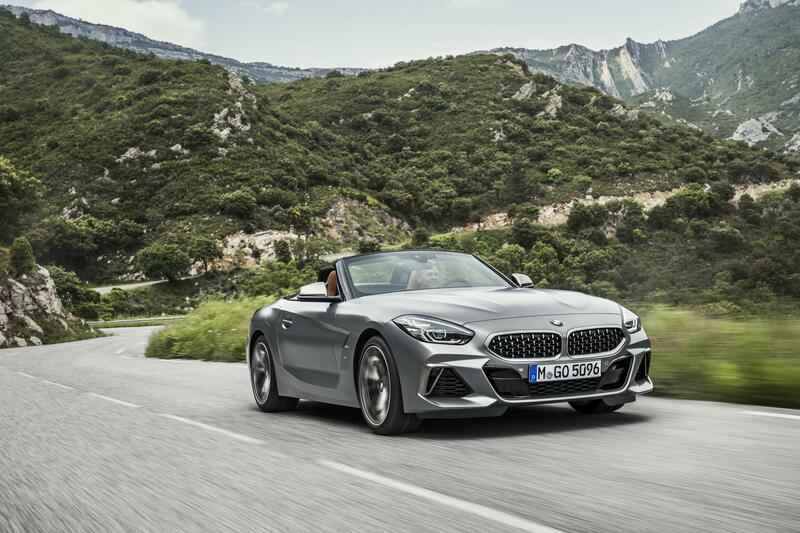 The new BMW Z4 M40i has a particularly sporty character with a Cerium Grey finish for the surround and front face of the mesh-design BMW kidney grille, the exterior mirror caps and other design features, plus trapezoidal exhaust tailpipes. Interior: keen driver focus and an aura of class. 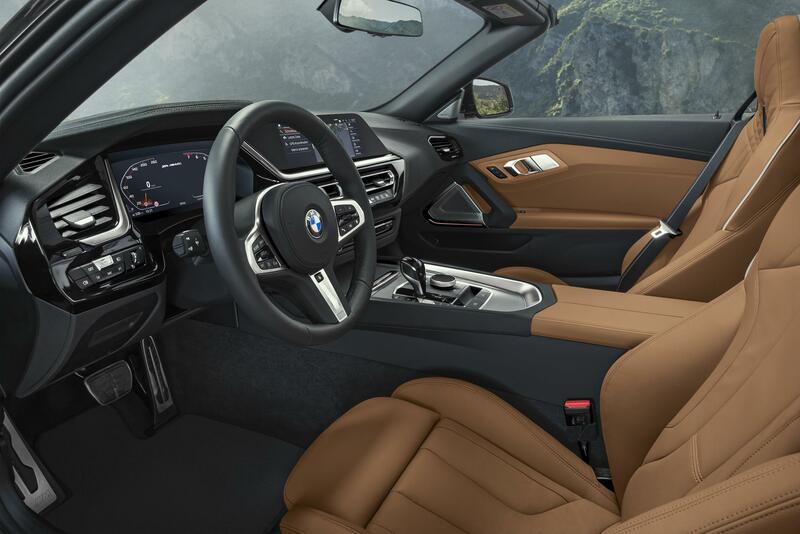 The cabin of the new BMW Z4 has been improved to reflect the new driving dynamics and comfort from within the car. Electroplated detailing adds to the roadster’s ambience, while the clearly structured arrangement of the controls focuses the attention even more on the driving experience. Both driver and passenger settle into model-specific sports seats with integral head restraints. The BMW Z4 is upholstered in Vernasca leather as standard on all models and comes in a choice of four colours (Black, Magma Red, Ivory White or Cognac). 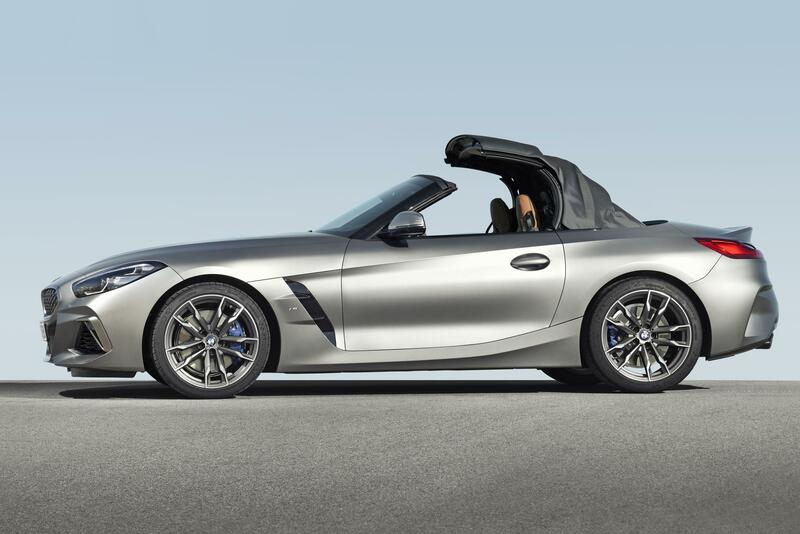 Heated seats are also fitted to all BMW Z4s for the ultimate open-top driving comfort. The optional wind deflector fits flush between the fixed rollover bars. The storage space behind the seats, the cup holders under the centre armrest and the large door pockets add further practical features. Boot capacity is 281 litres whether the soft-top is open or closed – an increase of more than 50 per cent compared to the outgoing model. BMW M Performance model with straight-six engine. 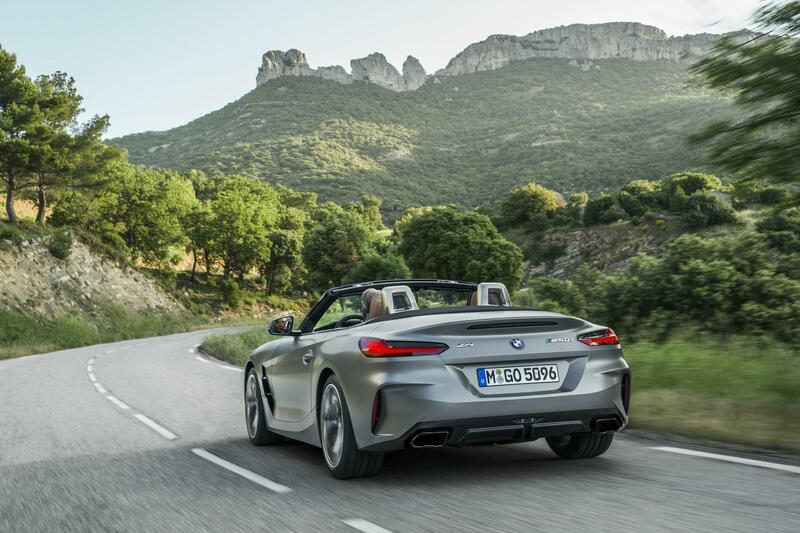 Powering the new Z4 will be a choice of BMW’s latest turbocharged petrol engines. 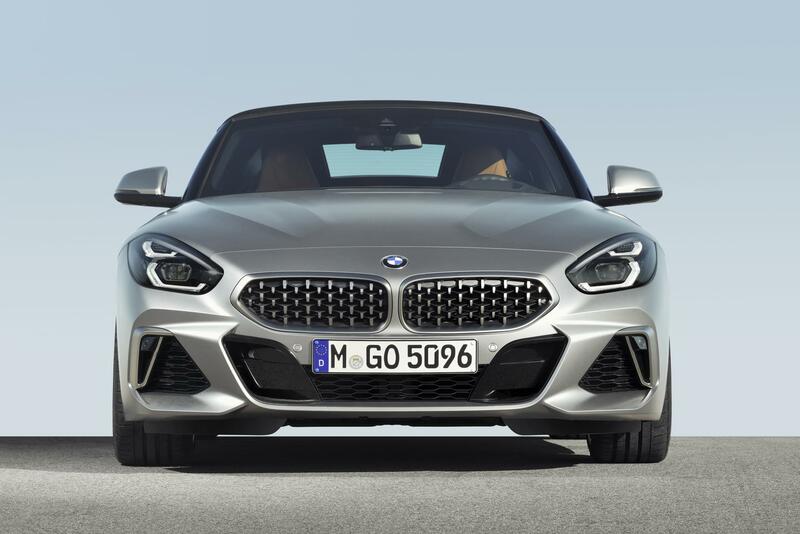 The new BMW Z4 M40i features a straight-six unit with M Performance TwinPower Turbo technology. Its standout features include a water-cooled exhaust manifold integrated into the cylinder head, sharper turbocharger response and superior acceleration, and direct injection technology, which now works at increased maximum pressure of 350 bar. Drivers have a maximum output of 340hp at their disposal, plus 500Nm of peak torque. 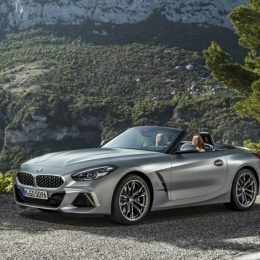 Variable sport steering comes as standard on all model variants, while the electronically controlled dampers, M Sport brakes and electronically controlled M Sport rear differential fitted as standard to the BMW Z4 M40i make the car even nimbler on the road. 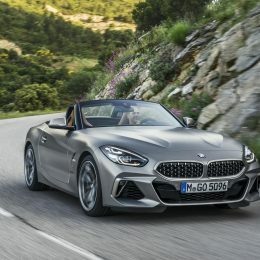 The new BMW Z4 M40i can sprint from zero to 62mph in 4.6 seconds and has a combined fuel consumption of 38.7mpg, equating to CO2 emissions of 165g/km*. 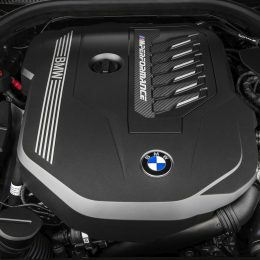 The straight six engine now runs more cleanly, too, thanks to a system of emission control that comprises an enlarged, close-coupled catalytic converter and a gasoline particulate filter, and enables the new Z4 M40i to meet the extremely stringent Euro 6d-TEMP emissions standard. More power with lower emissions – the new four-cylinder engines. 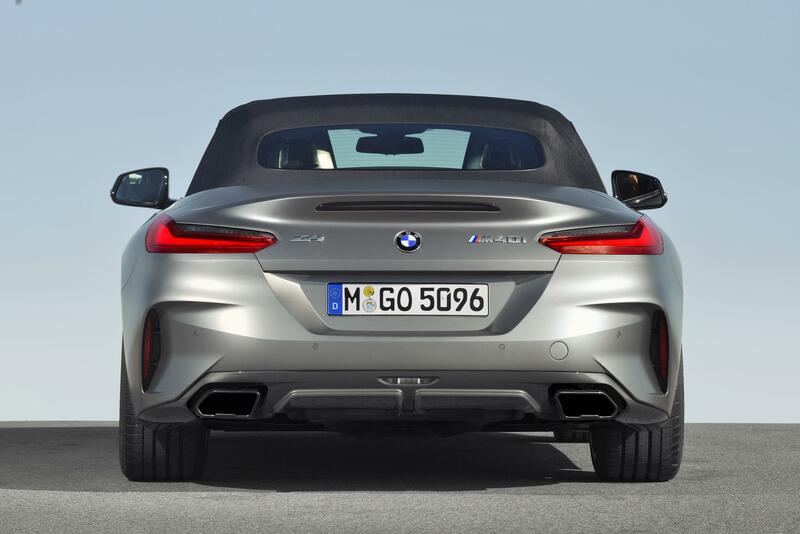 The choice of engines for the new BMW Z4 is rounded off by a pair of new four-cylinder units. Both have a capacity of 2.0 litres and likewise set new standards in terms of power delivery, efficiency and emissions. 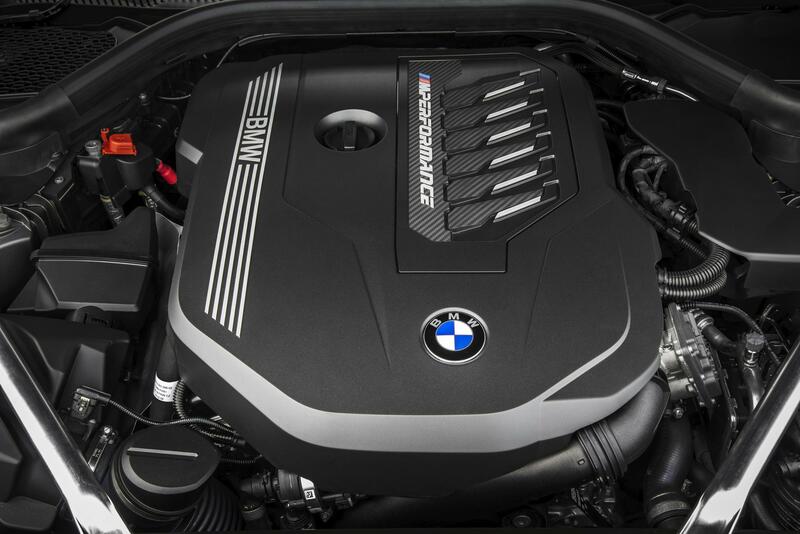 The output of both engines has been increased by 13hp over their predecessors. The engine under the bonnet of the new BMW Z4 sDrive30i delivers its maximum output of 258hp, while peak torque of 400Nm is available. The result is a zero to 62mph sprint time of 5.4 seconds. Combined fuel consumption of 47.1mpg and CO2 emissions of 138g/km* is proof of the model’s outstanding efficiency. 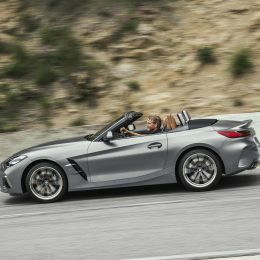 The maximum output of 197hp developed by the new BMW Z4 sDrive20i between 4,500 and 6,500rpm and peak torque propels the car to 62mph from rest in 6.6 seconds. 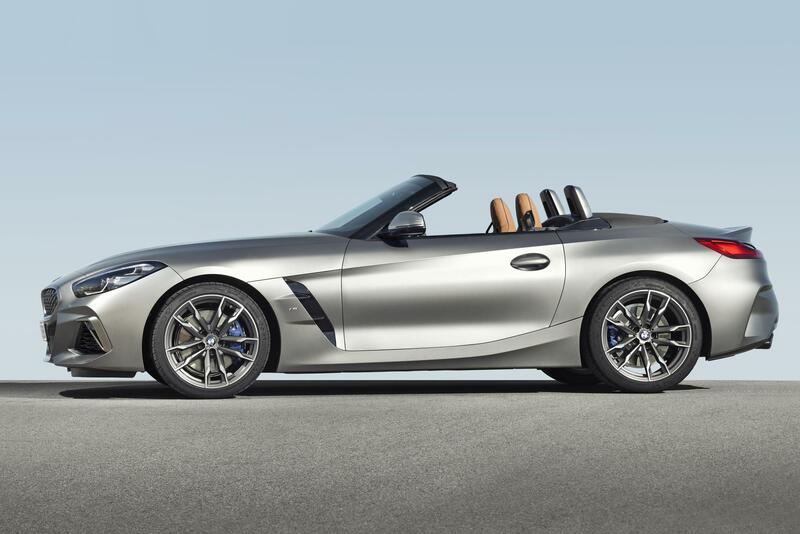 The new BMW Z4 sDrive20i burns an average of 47.1mpg and produces CO2 emissions of 138g/km*. Eight-speed Steptronic Sport transmission with optimised efficiency. All model variants of the new BMW Z4 come equipped with the eight-speed Steptronic Sport transmission as standard. Besides a wider ratio spread, the latest version of the automatic transmission also offers even sportier gear shifts. The transmission also features a Launch Control function for accelerating hard from a standing start with optimised traction. 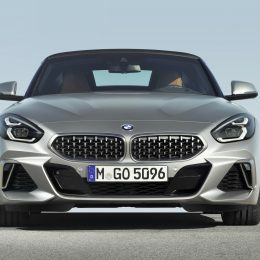 The eight-speed Steptronic Sport transmission fitted in the BMW Z4 M40i has been configured with M specific shift characteristics very much in tune with the straight-six engine’s power delivery. New chassis design enhances both agility and comfort. The chassis technology in the new BMW Z4 comprises a newly designed double-joint spring strut axle at the front and a five-link rear axle making its debut in a BMW roadster. This combination strikes just the right balance between sportiness and ride comfort. The front axle subframe and control arm mountings are extremely rigid, which lends itself to precise cornering characteristics and has a beneficial effect on the drivetrain’s acoustics. The sports car tuning of the front axle elastokinematics aids the new Z4’s steering precision at the same time as making its lateral handling characteristics more dynamic. Fitting aluminium control arms and swivel bearings has reduced unsprung masses, resulting in superior agility and efficiency. The new rear axle likewise employs a lightweight aluminium/steel design that saves weight. The large supporting base and very rigid structure of the rear axle subframe as well as the shear panels used for connecting it to the body result in extremely precise wheel guidance. All of which makes it possible to blend agile handling with a high level of ride comfort. The car’s impressively sporty handling characteristics are further aided by a powerful lightweight braking system and the Dynamic Stability Control (DSC) system, whose wealth of features includes the Anti-lock Braking System (ABS), Dynamic Traction Control (DTC), Cornering Brake Control (CBC), Dynamic Brake Control (DBC) and Start-Off Assistant. 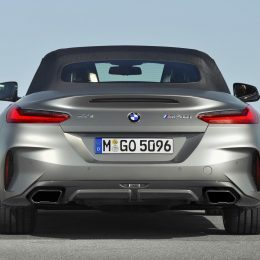 The Performance Control function also included as standard gives the new BMW Z4 even nimbler handling by varying the distribution of drive torque to the rear wheels according to the situation at hand. M Sport differential, Adaptive M Sport suspension, M Sport brakes and high-performance tyres. 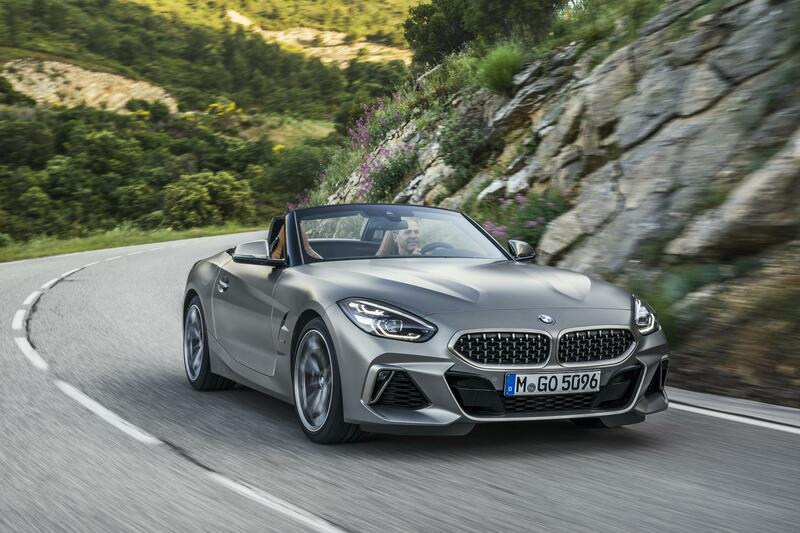 The Adaptive M Sport suspension, M Sport brakes and M Sport differential (all part of standard specification for the new BMW Z4 M40i, together with high-performance tyres) elevate the car’s sporty handling abilities to even greater heights. With these chassis systems on board, the differences in the car’s responses when moving between the COMFORT, SPORT and SPORT+ modes with the Driving Experience Control switch are particularly noticeable. As well as lowering the car’s ride height by ten millimetres, the Adaptive M Sport suspension also adds electronically controlled dampers, whose operating characteristics can assume a more comfortable or more dynamic bias depending on the mode selected with the Driving Experience Control switch. 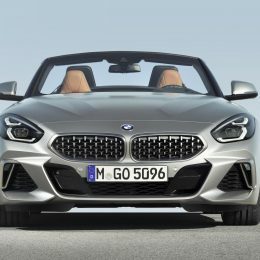 The electronically controlled M Sport rear differential gives the handling of the new BMW Z4 an even sharper sporting edge. An electric motor generates a locking effect that limits speed equalisation between the inside and outside rear wheel when cornering, making it possible to power out of bends with remarkable dynamic verve. The active differential lock also gives the car greater assurance when darting through corners, and aids ride comfort and traction, too. The variable distribution of drive torque between the left and right-hand rear wheels nips any understeer or oversteer in the bud without the need to brake. Innovations to enhance driving pleasure, comfort and safety. The options list contains all sorts of different ways to customise the new BMW Z4 so that it reflects the owner’s personal style. The list of options includes Active Cruise Control with Stop & Go function, the Lane Change and Lane Departure Warning systems, as well as a Parking Assistant including Reversing Assistant. 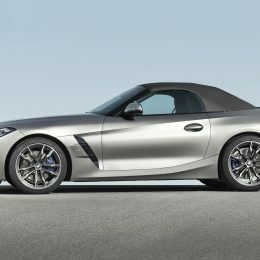 The new BMW Z4 is also the first roadster to be made available (as an option) with the BMW Head-Up Display. Safety can be given a further boost by opting for the Adaptive LED headlights, whose pioneering matrix technology for the high beam allows range to be increased while preventing other road users from being dazzled. The high beam is divided into four LED segments, which can be activated and deactivated independently of one another as the traffic situation demands, and when travelling at speeds above 44mph. 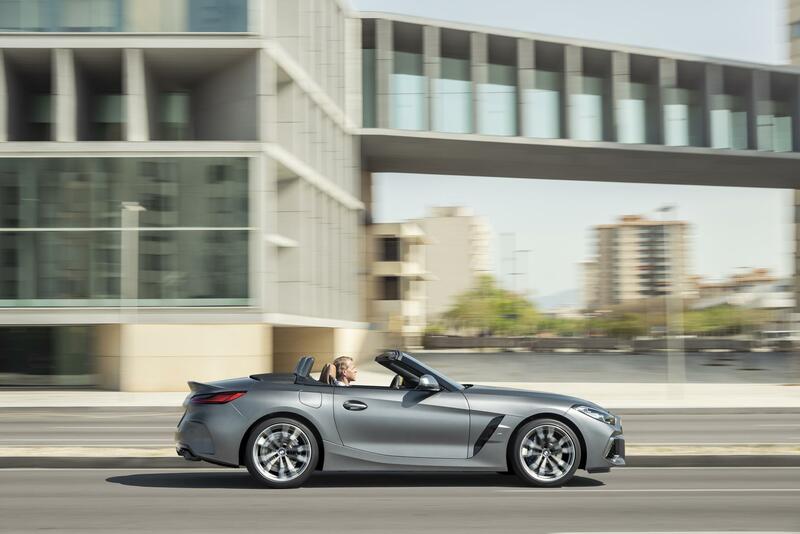 The instant the front mounted camera on the new BMW Z4 detects an oncoming vehicle or a vehicle in front, low beam only will be used to illuminate the area around the vehicle. The other features of the Adaptive LED headlights include the adaptive and cornering light functions, which use an additional LED module. Finally, the low-beam range is increased in motorway driving to optimise illumination of the road ahead. With the optional Comfort Access feature fitted, the soft-top can be operated using the car key. The ambient lighting, fitted as standard, brings a particularly atmospheric mood to the cabin. LED fibre-optic guides light up the instrument panel’s accent strips on either side of the steering wheel and provide indirect illumination of the centre console’s edging, accentuating the areas of the cockpit of most importance for focused driving. The colour and brightness of the lighting effect are adjusted in the iDrive menu. The BMW Z4 is fitted as standard with an advanced hi-fi speaker system which includes a total of ten speakers and output of 205 watts. For an even more impressive aural experience, there is the Harman Kardon surround sound system complete with digital amplifier, 12 speakers and 464-watt total output. 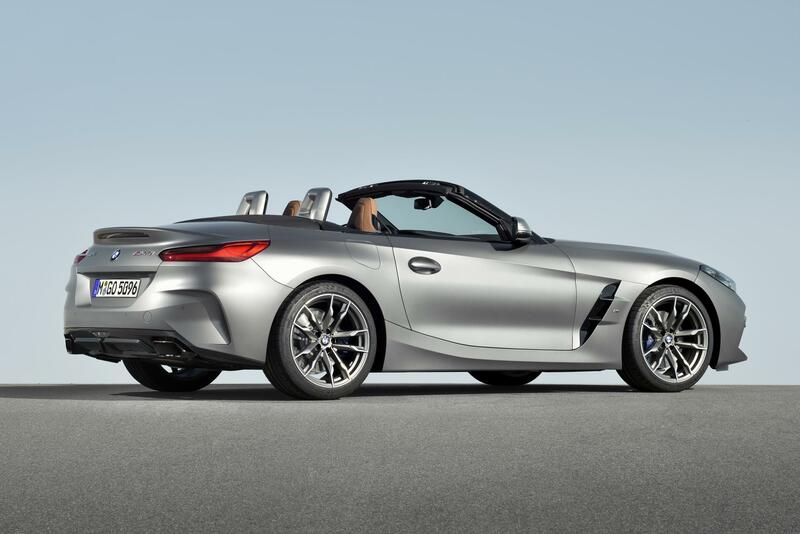 The new BMW Z4 comes as standard with bespoke M Sport seats including integral head restraints. The seat rails have been extended in length by 23 millimetres over those in the predecessor model, allowing the seats to be adjusted to the ideal fore/aft position. Electric seat adjustment with memory function is optionally available for both seats (standard on M40i), allowing their fore/aft position, height and tilt as well as the backrest angle to be altered and stored using a control pad on the outer edge of the seat cushion. The M sports seats also include electro-pneumatic backrest width adjustment to optimise lateral support through high-speed corners. 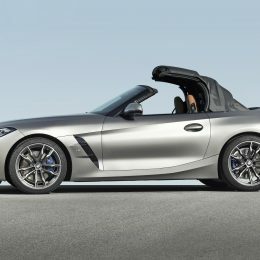 The practicality of the new BMW Z4 has been increased by features such as a storage space behind the seats with a retaining net, large cupholders under the centre armrest cover (which folds open in two sections with a longitudinal split) and roomy door pockets. The boot capacity is 281 litres (with the softtop open or closed), an increase of more than 50 per cent compared to the previous Z4. An optional through-loading system extends the possibilities for handling various transportation tasks during everyday use and when going away on trips. Innovative systems to help drivers stay in lane, park and reverse. The highly advanced nature of the new BMW Z4 is further underlined by the class-leading variety of driver assistance systems on offer. Collision Warning and the Pedestrian Warning with City Braking function come as standard, as does the Lane Departure Warning system. The list of options includes Active Cruise Control with Stop & Go function, the Speed Limit Info system with No Passing Info display, distance information, the Lane Change Warning System, plus Rear Collision Prevention and Cross-Traffic Alert. These functions can be purchased together in a Driving Assistant Package. 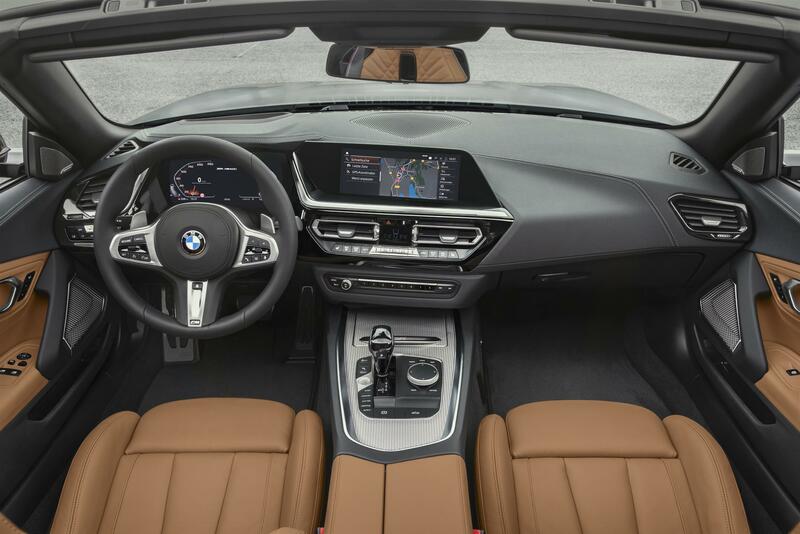 Elsewhere, the BMW Head-Up Display, which projects driving-related information onto the windscreen and therefore straight into the driver’s field of view, is available for a roadster for the first time. The only system of its kind in this segment, it shows the driver the car’s speed in figures, along with status indicators from the driver assistance systems, route guidance instructions and lane recommendations from the navigation system, Check Control messages, and in-car entertainment details, such as the radio station or track title. Full¬ colour graphics are used to convey the relevant information. Active Park Distance Control and the rear view camera come to the driver’s aid when manoeuvring or parking. These two systems both form part of the Parking Assistant, which takes care of steering, accelerating, braking and selecting gears during parking manoeuvres, and includes a reversing camera. The range of functions also includes the Reversing Assistant, which offers the highly convenient option of automated reversing in situations where there is little margin for error or the driver does not have a clear view. To do this, the system stores the steering movements for the section of road the car has just driven forward along. It then traces these last forward movements when reversing and keeps the car on exactly the same path for a distance of up to 50 metres. All the driver has to do is operate the accelerator and brake pedals and keep an eye on the area around the car. 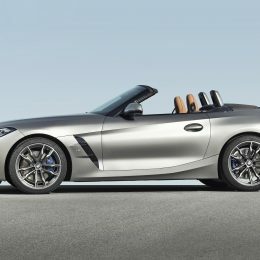 The BMW Live Cockpit Professional offered as standard for the new BMW Z4 brings a new display & operating system and the ultimate in connectivity together into a superb all-round package. Its ensemble of fully digital displays consists of a high-resolution instrument cluster behind the steering wheel and the Control Display in the centre console, each of which has a screen diagonal of 10.25-inches. 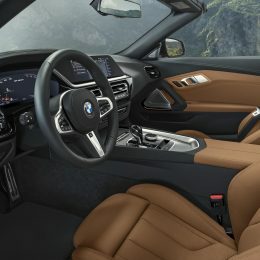 The BMW Live Cockpit Professional also features an adaptive navigation system, a hard-drive-based multimedia system, two USB ports, plus Bluetooth and WiFi interfaces. 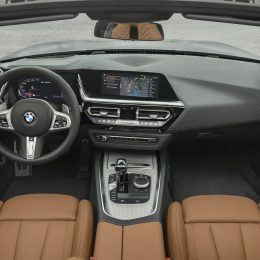 The inclusion of the BMW Live Cockpit Professional means that the car benefits from the most recent incarnation of the display & operating system, powered by the brand new BMW Operating System 7.0. Its displays are fully digital and geared even more closely to the driver’s personal needs so as to optimise attention levels. The main menu of the Control Display allows the driver to configure up to ten pages, each showing two to four pads (tiles) with live content. Both the content and the visuals are personalised to an even greater degree, as illustrated by vehicle graphics that match the actual model colour and equipment line. The Control Display graphics adapt depending on the operating method, and the voice control system based on natural language understanding also reaches new heights. The Remote Software Upgrade feature keeps the new BMW Z4 up to date with the latest software. All updates will occur over the air, either via the BMW Connected app on a smartphone or directly into the car using its built-in SIM card. Installation is every bit as simple as a smartphone update. The contents of the upgrades vary, from security and quality enhancements to new software services and improved vehicle functions. “Connected Navigation” encompasses a number of digital services designed to turn seamless and contextual route planning both inside and outside the BMW into an even more sophisticated experience. In future, drivers of the new BMW Z4 will be able to send destinations from various apps straight to their car’s navigation system. The most important destinations will be stored in BMW Connected and synchronised with the car, so that key addresses can be accessed from any device at any time. One particularly helpful new feature is the Parking Space Assistant, which proposes various parking options to the driver in good time before the destination is reached. This service includes providing information on the nearest multi-storey car park as well as proposing routes offering a particularly good chance of finding a parking spot close to the destination. The existing On-Street Parking Information and ParkNow services have been intelligently incorporated into the new assistant’s range of functions. BMW Digital Key: turning a smartphone into a car key. As part of the Comfort Access option, the BMW Digital Key employs Near Field Communication (NFC) technology to allow the new BMW Z4 to be locked and unlocked from a smartphone, dispensing with the need for a conventional car key. The smartphone simply has to be held up to the door handle to open the vehicle and, once inside, the engine can be started as soon as it has been placed in the Wireless Charging or smartphone tray. Accessible via the BMW Connected app, the Digital Key offers unrivalled flexibility, as the driver can share it with up to five other people. The BMW Digital Key is available for all NFC-capable Samsung smartphones. 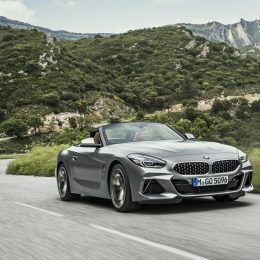 The new BMW Z4 will be on sale from 4 October 2018 with a market launch from March 2019, pricing will be announced on 2 October.